Udayan Borthakur is a wildlife biologist by profession with a specialization in conservation genetics; currently working with Aaranyak, a scientific research organization based in Guwahati. 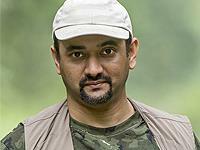 He is also the founder head of Aaranyak’s Wildlife Genetics Division since 2008. He has 14 years of experience in the field of ecological and genetic research and has worked with the University of Chicago, USA; Wildlife Institute of India, Dehradun; and the Bombay Natural History Society. He has been instrumental in two dozen projects so far and also has several scientific papers published to his credit. Udayan is a freelance wildlife photographer and his photography work can be viewed on his website as well as in print publications of several magazines, books & reports of na-tional and international repute. As a student, wildlife intrigued him and he took up photography as a tool for documentation. As a photographer, his primary interest lies in using photography as a media for mass awareness towards conservation. In addition, his work as a photographer and explorer has led to several discoveries on the presence of rare wildlife species in the far remote corners of North East India. For e.g. the most recent addition to the list of primates of India, the White-cheeked Macaque is a result of the photography expeditions by his team to Eastern Arunachal Pradesh. In the year 2015, an image shot by him reached the final round of BBC Wildlife Photographer of the Year competition. Apart from photography, Udayan is interested in sports such as weight lifting and martial arts. He has been a student of Kung Fu since 1995 and is also trained in other forms of martial arts. He has participated at State Level Weight Lifting Championships during 1999-2001 and was awarded a gold medal and overall best-lifter at the University Championships in 2002.